I think that's trying to simplfy a situation that at the time wasn't. Maybe if the couple hadn't repeatedly lied about where the little girl was from it wouldn't have been so bad. Uh, it was that simple when it started. She was blonde and fair and green-eyed and her parents weren't. Unless the entire camp was brought in and all the children questioned about their parents--did I miss that article? All I'm saying is it's easy to sit on the outside and criticize without knowing all the facts. Something that no police department ever releases all of for prosecution reasons. On top of that you can't trust everything that the news reports to be the honest truth because as you just pointed out they made it sound one way when it had nothing to do with the article they were writing about. I'm not saying it doesn't happen I'm just that we don't always know everything about what made them take a second look in the first place. News can say one thing fact and truth can be something totally different. 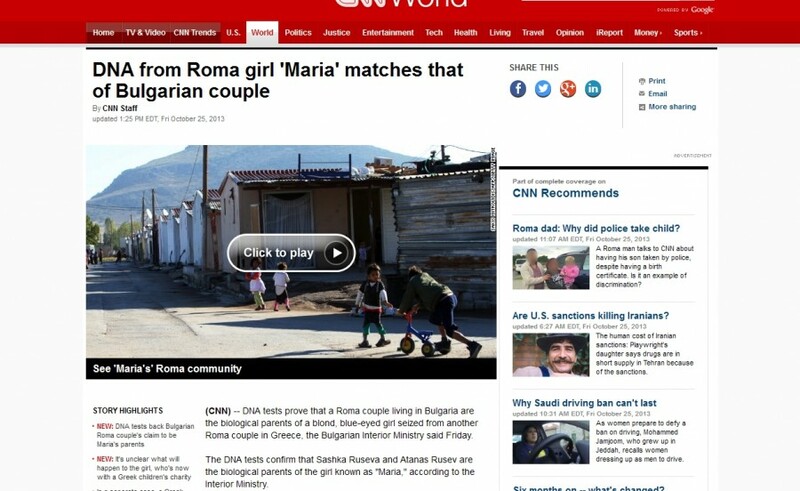 Two kids, two blondes, both removed from their families for being blonde in a Roma family, right after the story about Maria broke.